Summers in the White Mountains are filled with adventure, but it’s time to start turning our attention to the upcoming fall and winter months. With schools back in session across the country, many parents and caregivers are finding themselves thrust back into the hectic pace of day-to-day life. So this fall, treat yourself or your loved ones to something special, and come spend a few blissful nights at our award-winning Bed and Breakfast in the incredibly beautiful White Mountains of New Hampshire. Fall in these beautiful mountains is simply magical, as the colors of the season change from green to the signature golden, fiery hues of autumn. When you stay at our luxury Bed and Breakfast, you’re part of our family. Come see what makes us different than our competitors. Book your room at our New Hampshire Bed and Breakfast today. 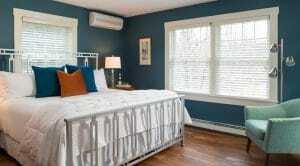 Why Choose our Bed and Breakfast? The Sugar Hill Inn Bed and Breakfast is situated just minutes from all there is to enjoy in the White Mountains, including the popular Flume Gorge, Franconia Notch State Park, and the miles upon miles of trails in the White Mountains. From here, your options are endless. Perhaps you want to explore the area’s many waterfalls and covered bridges, followed by dinner at our award-winning restaurant? Or, take in the area’s fall splendor on the Cog Railway up to the peak of Mount Washington, or drive up the famous Kancamagus Highway. However you spend your time with us, our romantic getaway will be your perfect home base in the White Mountains. Plan a little escape this fall at our New Hampshire Bed and Breakfast. You won’t regret it! Book your room today.